Cash payments of social grants are still to be done by Cash Paymaster Services — for now. By Barbara Maregele for GROUNDUP. The South African Social Security Agency (Sassa) will for the first time make electronic payments to approximately two million social grant beneficiaries through its new corporate Postbank account on 1 February, instead of through Grindrod Bank. Postbank is the banking division of the Post Office which signed a deal with Sassa in 2017 to pay social grants from 1 April 2018. Grindrod is the banking partner of Cash Paymaster Services (CPS), which currently pays social grants. The Post Office will assist Sassa with the management of social grants, including electronic payments, but not cash payments. Cash payments — at a CPS cash point or through a retailer — will not be managed by the Post Office at this stage. Sassa has invited bidders for the cash payments. Bidders have until the end of this week to apply. CPS’s current grant payment contract with Sassa, which began in February 2012, was declared invalid by the Constitutional Court in 2014. The court allowed CPS to continue paying grants until March 2018 so that Sassa could appoint a new service provider. In time Sassa was expected to take over the payment system itself. Meanwhile, the court ordered Sassa to submit regular reports on progress. In its latest report to the court, filed on 8 January, Sassa said it had successfully paid a sample group of 98 beneficiaries through its Postbank account in January. Since November last year, the agency has been encouraging beneficiaries to rather get their grants paid into their commercial bank accounts, calling it the “easier and more convenient” way to receive grants. But for now the beneficiaries would have to pay their own banking costs, the agency said in a letter to its regional managers last year. The Black Sash Trust has previously warned Sassa against rushing to invite beneficiaries to open bank accounts until Sassa has finalised a deal with commercial banks for low-cost accounts for them. In the meantime, beneficiaries will be charged normal banking fees when withdrawing their grants. 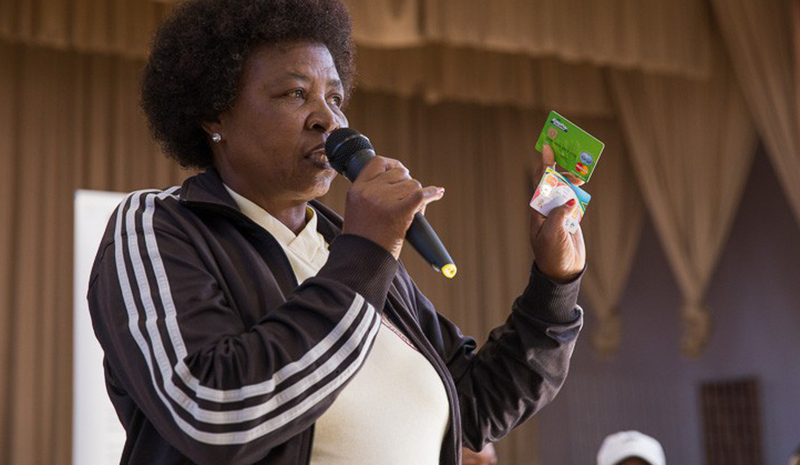 According to Tshediso Mahlaka of Sassa, about 10.6-million people have Sassa cards. Of these, 5.7-million use the cards to withdraw their grants electronically from either ATMs or retailers such as Shoprite or Boxer, he said. An additional 2.9-million people “consistently visit pay points” to get their grants paid in cash. “Separate to these, approximately two million people have opted to have their grants paid directly into their own bank account,” he said. According to its report last week, Sassa visited a number of communities during December in Gauteng, North West, Limpopo, the Eastern Cape and Mpumalanga to tell beneficiaries about the different payment options. Following these sessions, an additional 10,591 people gave their bank details to Sassa to get their grants paid directly into their commercial bank account. These beneficiaries will also be paid through Postbank from February, alongside the two million whose grants are already being paid into their bank accounts. Sassa told the court that all the beneficiaries’ existing biometric data was ready to be transferred to the Post Office. “The relevant provisions of the Protection of Information Act, 2013 will be complied with when releasing the beneficiary data,” Sassa said. “Sassa plans to over time take over the ongoing enrolment of beneficiaries but for now the Post Office will be helping to authenticate beneficiaries’ biometrics through the Home Affairs National Identification System,” it said. Will CPS still pay grants after April? It is unclear whether CPS will be allowed to re-apply for the cash payments contract now being advertised. The company’s involvement in the payment system has been controversial for several years, more recently because of unwarranted deductions from beneficiaries’ grants. In the advertisement in the Government Gazette on 8 December 2017, Sassa invited potential service providers to a compulsory meeting at its head offices in Pretoria on 14 December. It said that all bids “would be evaluated on functionality” and that only service providers who “score a minimum of 70 points for functionality will be further evaluated on price and B-BBBE level contribution”. Prospective bidders have until 11:00 on Friday 19 January to apply for the contract. The advert does not include further specifications or the cost of the contract. Speaking to MPs in Parliament in November 2017, Minister in the Presidency Jeff Radebe gave his assurance that CPS would have no involvement in the new payment plan. But in the same week, the panel of experts appointed by the Constitutional Court to evaluate Sassa’s plans recommended that CPS be allowed to make cash payments for another six months to ensure uninterrupted grant payments in areas where there are no alternative payment facilities within five kilometres from where beneficiaries live.